When I first started really collecting Fantastic Four stories, I naturally began with their own title. But it wasn't long before I started expanding to other Marvel books where the characters appeared. 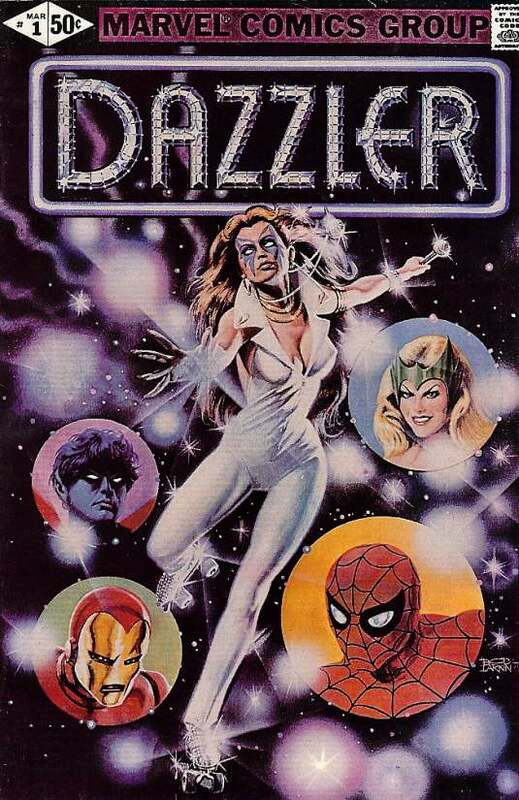 I somehow learned that they appeared in a couple early issues of Dazzler (probably a footnote in a contemporaneous Fantastic Four after the Human Torch said something about dating her) and since the issues were still fairly recent, they weren't hard to track or expensive to purchase. The FF only appeared in issues #2-5, but I went ahead and got #1 as well. I got the books, and sat down to read them. I cracked open #1 and was surprised to see Louise Jones' signature on page 1 under the indicia! That was kind of cool, I thought. The first comic I owned that was signed by one of the people who worked on it! Well, I assumed the signature was legit -- if you were going to forge a creator's signature, why would you do it on the inside of the book and why would you choose the editor instead of the writer or artist? So I dove into the story, and had to stop on page eight. At the bottom of the page was the unmistakable signature of Walt Simonson! The issue was drawn by John Romita Jr. and inked by Alfredo Alcala, so naturally this seemed a bit odd. Especially since I didn't at that time know he and Jones had recently gotten married; I wouldn't have been able to make the connection that he might have been quickly available to help on any art chores. I think it was probably another 6 or 8 years before the internet was big enough that both Simonson and myself were online, and he might've proven easy to contact. I believe I emailed him about it at the time, and he confirmed that he did help out a bit. I don't still have that email, but in looking through the issue itself, I vaguely recall him saying he basically did some of the work in the sequence of the X-Men in the Danger Room that ran on pages 8-10. The issue was originally complete some time before it was published. I did two or three drawings of Kitty to bring the book into continuity. Kitty Pryde indeed appears on pages 8 and 10 of the issue; she had joined the X-Men in Uncanny X-Men #139 about five months before Dazzler #1 came out. As Cyclops had left the team in #138, that's likely who Romita Jr. had drawn in originally. So there you have it! Despite no comic database online mentioning it anywhere (some do note he supplied art for issue #2, but nothing on #1) you've just read conclusive proof that Walt Simonson provided uncredited artwork for Dazzler #1! Do I get a No-Prize for reporting that?